Summer holidays are still in full swing and what better way to feed the family than a good old traditional Aussie BBQ in the outdoors. Whether breakfast, lunch or dinner you can always enjoy a BBQ. What better way to celebrate Australia Day on 26 January than by inviting all your friends and family to get together and spend the day in the open air standing around the BBQ, with a beer or a glass of wine. 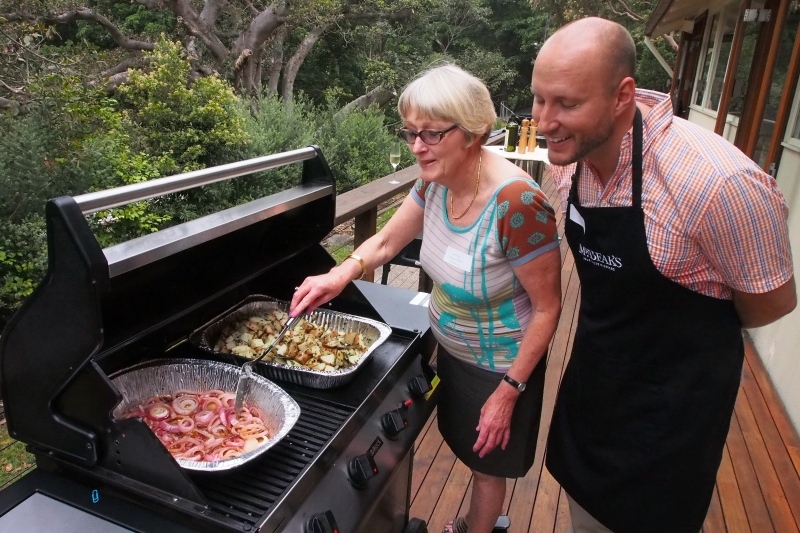 Australians have now become much more sophisticated in their eating habits, being inspired by the many cooking and foodie shows on TV. 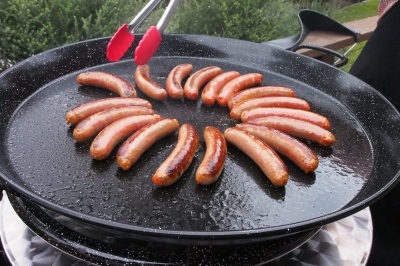 No longer does the traditional BBQ just mean a few sausages and steaks thrown on the grill while everyone stands around watching as the meat is constantly turned over. Recently I attended the ultimate Aussie BBQ, cooked to perfection by ex MasterChef contestant, Kevin Perry, whose specialty is BBQ. Kevin cooked such tasty treats as smoky beef chorizo and potato tortilla, made with the incredibly tasty Mr Beak’s Smoky Chorizo Sausages, followed by what could only be described as a 5 star gourmet burger. Kevin told us that Mr Beak’s products are all made from 100% Australian beef and were gluten and MSG free so nobody had to worry if they had any dietary issues. He also cooked some great plain beef sausages for us as well. Now I’m inspired to get my tongs out and fire up the BBQ for Australia Day. I love attending food fairs because they give me the opportunity to find new gourmet treats and most importantly, the opportunity to actually taste the tempting variety of offerings. I am lucky to always find something unique that I would never probably notice when doing my weekly shop. At a recent food fair held at Sydney’s Convention and Exhibition Centre, there were so many stalls displaying a variety of tempting products. I did not want to miss anything, so after methodically walking up and down the isles, I came across some sensational gourmet condiments and jams that I will definitely use to pep up my meals. I was attracted to The Regimental Condiment Company’s display because of the eye-catching labels on their various sized bottles. 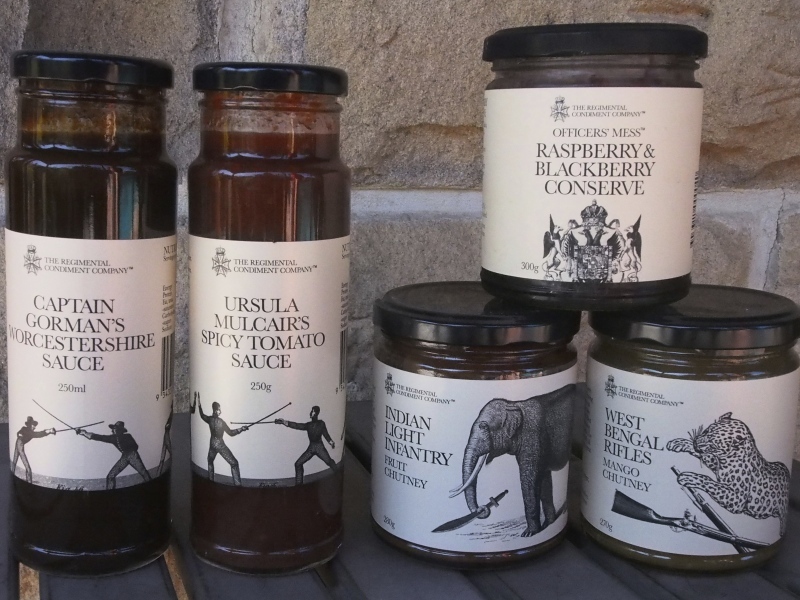 Their product ranges had historic military names such as Friends of the Regiment Sauces, Officers’ Mess Jams and Jellies, The Regimental Chutneys & Relishes and The Aviators Mustards & Horseradish. I was told that this award winning Australian food company produces a range of gourmet food products emanating from the glory days of the Officers’ Mess. The company started in 2010 with a collection of old family recipe books, a passion for cooking and a love of military history. Their recipes had been handed down through the generations. Where possible, the products are all natural and contain no artificial colours or preservatives and nearly all of them are manufactured in Australia at their kitchen in Daylesford, Victoria to traditional and family recipes. I have tried several of their products including Captain Gorman’s Worcestershire Sauce, The Punjab Battery Indian Chutney and Officers’ Mess Raspberry & Blackberry Conserve, all of which enhanced the enjoyment of my food. At the same fair I came across another great Australian company based in Tasmania, producing savoury marmalades and chutneys. The Tasmanian Gourmet Kitchen, started four years ago, supports local growers and uses fresh produce. Bill’s Spiced Pear Chutney, Spicy Tomato & Apple Chutney, Red Pepper Marmalade and Beetroot Marmalade are superb. Overseas tourists visiting Australia and locals residents looking to book accommodation can now feel confident when making their selection, thanks to the introduction of the T-QUAL Tick. The T-QUAL Tick is the Australian Government’s national symbol of tourism quality. Tourism businesses that carry the T-QUAL Tick have undergone rigorous assessment to ensure they deliver a quality experience. These businesses are members of quality assurance schemes that have met the requirements of T-QUAL Accreditation, the Australian Government’s quality benchmark for the tourism industry. Trust in the T-QUAL Tick and you can be assured that your chosen getaway will provide the quality you desire. There are thousands of great tourism operators that carry the T-QUAL Tick. The holiday season is still well and truly in full swing and for those who have still not made their mind up on where to go for a break, it’s most important that before making a final decision on where to stay, you look to see that the accommodation has been awarded the T-QUAL Tick. 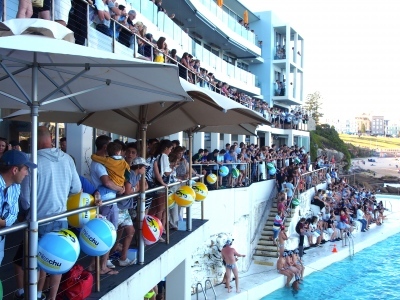 What a great start to 2013 when Bondi’s famous Icebergs Pool was the setting for Water Polo By The Sea last Friday, where we saw an evening of International Water Polo. The evening kicked off at 5.30 p.m. with Sydney University playing UNSW for the University Cup, followed by the Australian Sharks taking on the International All Stars at 6.30 p.m. The driving force behind the event is four time Olympian, Thomas Whalan, who commented “Water Polo by the Sea is the perfect way to showcase the sport that we love to an audience that may not otherwise be exposed to the game”. The international all-star team included three times Olympic Gold medalist and World Champions Tamas Kasas (the world’s most decorated player) and Tamas Molnar from Hungary, the Italian World Champions and Olympic Silver medalists Deni Fiorentini and Maurizio Felugo, Team USA Olympic Silver Medalist Tim Hutten, New Zealand’s only professional water polo player Joe Kayes who is based in Hungary and Britain’s Scott Carpenter. The huge crowd was served drinks (I can recommend the low calorie margaritas) and healthy snacks by waiters dressed in “budgie smugglers” which added to the beachside atmosphere. Not knowing anything about water polo before, I found the game very exciting and fast moving. The good looking and well built male players were also another plus in making water polo a sport I would not mind watching again. Sydney’s reputation as the Fireworks Capital Of The World remains, after the city exceeded all expectations with a spectacular display of fireworks on New Year’s Eve. 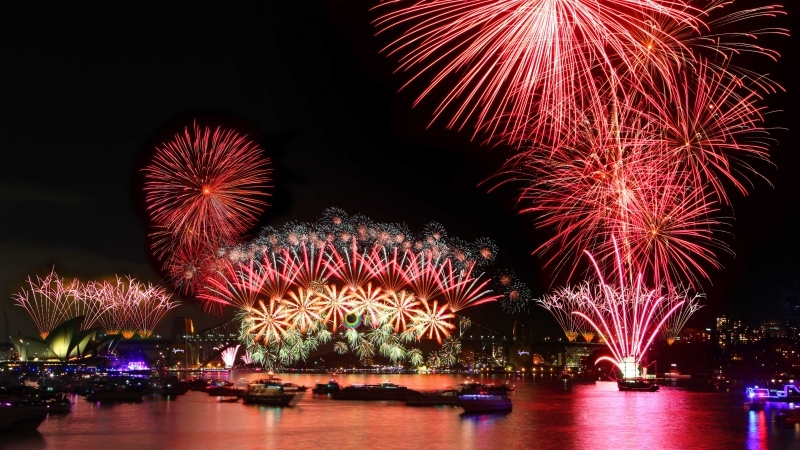 Promises made by Sydney Lord Mayor, Clover Moore, that the 2012 fireworks would be bigger and better than ever before, did not disappoint. Australian singer, Kylie Minogue, the NYE12 Creative Ambassador, did the honours of pressing the button to start the fireworks and ring in the 2013 year. Sydney’s Harbour Bridge was again the focal point of the fireworks display and I was fortunate to be a guest at the Lord Mayor’s New Year’s Eve Party held at the Opera House where we had expansive views over the harbour and were directly opposite the Harbour Bridge. We could not have had a better view anywhere in Sydney. The hours before midnight passed very quickly as we were entertained by singers and bands while enjoying the many varieties of canapés and drinks served throughout the evening. The Parade of Lights with boats of all sizes festooned in coloured lights sailing around the harbour was a highlight of the evening, along with the 9 p.m. fireworks display, for those, especially with children, who did not wish to wait around until midnight. My only disappointment of the evening was that we did not get to hear Kylie Minogue singing, but she did give a lovely speech. Sandra Tiltman. You are currently browsing the SANDRATBLOG.COM blog archives for January, 2013.